“We have always been impressed by the level of care and detail that SNAP 360 staff take across all of our projects. 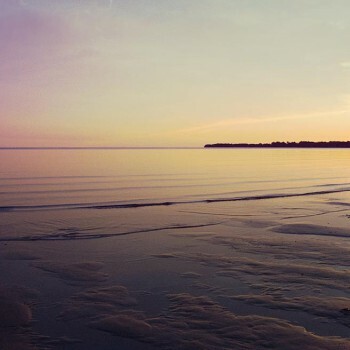 Whether it’s updating the look and feel of our of the four websites they manage for us, or building the back-end platform for our new Bay of Quinte kiosk from scratch, it’s always about achieving the best result possible and taking whatever time and resources are required to do it. We appreciate the diversity in their team and working team-to-team on the creative process. We also appreciate that they are eager to take on new and challenging concepts that might be outside of the realm of work they’re used to doing — and we can say with confidence that we’re very happy with the end results we’ve achieved on those projects. 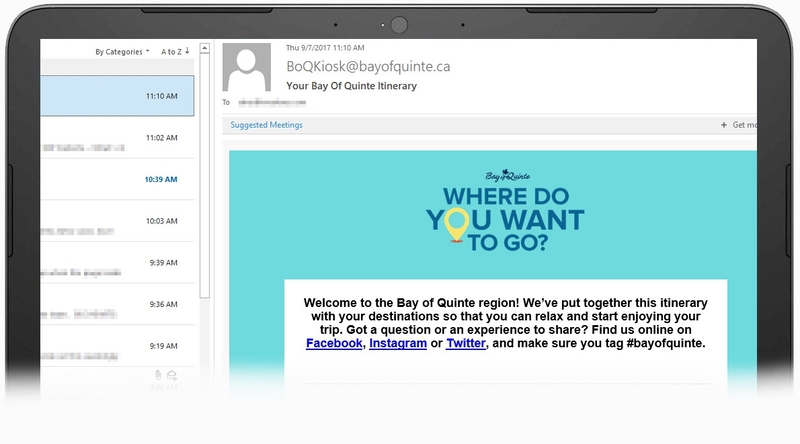 The Bay of Quinte Regional Marketing Board approached us with a intriguing question: could we design an interactive kiosk for the region’s visitors? 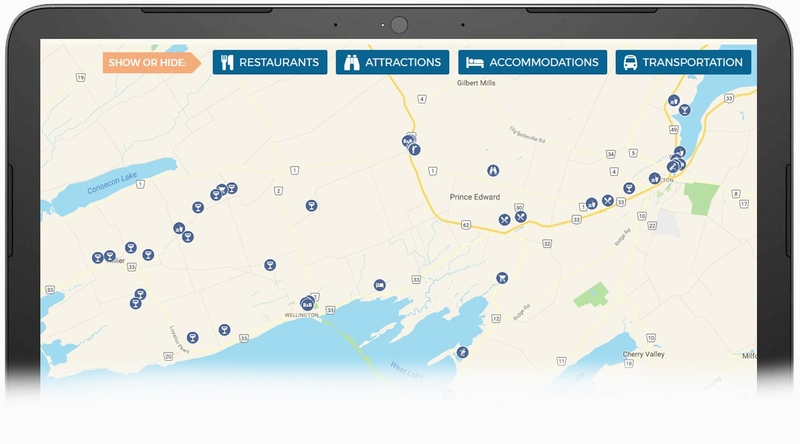 The goal was to design a kiosk that could be placed in high-traffic tourism locations around the Bay of Quinte region, such as hotels and resorts. The kiosks should be engaging and easy to use, enabling visitors to browse and discover local businesses and attractions, enhancing the experience of their visit and boosting local business. This kind of project–with custom design and functionality–is our forte, so we jumped right in. 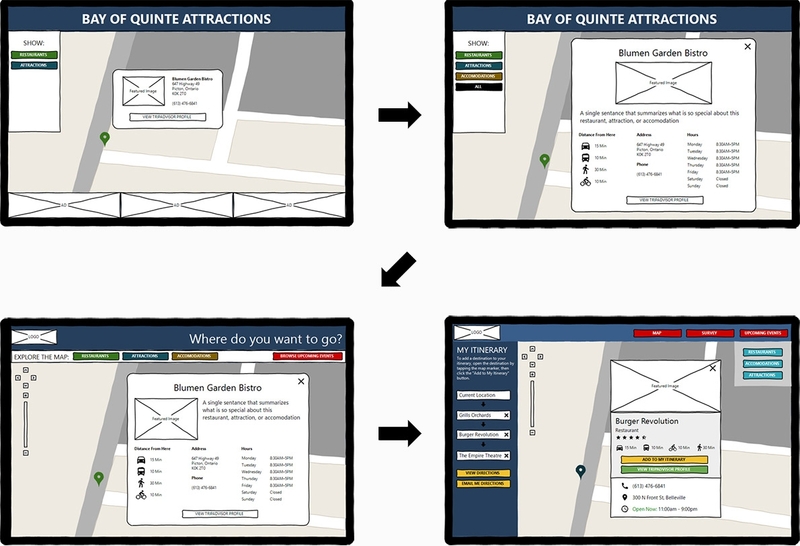 We worked closely with the Bay of Quinte team to develop and fine-tune the design and functionality of the kiosks, using an iterative process to develop an exceptional final product. The public launch of the kiosks marked a major milestone for the region with positive plaudits from the local media. Currently installed in 9 locations, with more to come, each kiosk averages 50 users/day! We began by helping the team source the best hardware for the job. 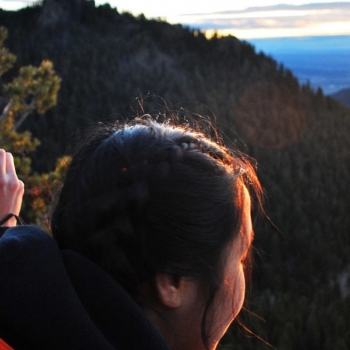 In the end, we decided on the Samsung View. With an 18″ screen, this is the largest commercial tablet available. The kiosk housing was custom-built by the local machine shop Machining Centre, with an outer frame printed by the local print shop JP Print. 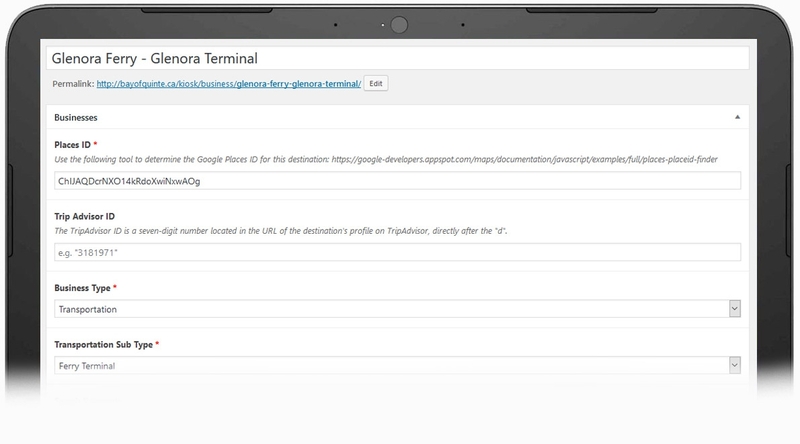 We knew that we wanted the kiosk interface to be web-based. This would enable central administration and keep the budget down. However, we also wanted to make sure that the tablet’s browser was locked down so that users couldn’t inadvertently (or intentionally!) exit the application or surf to other websites. 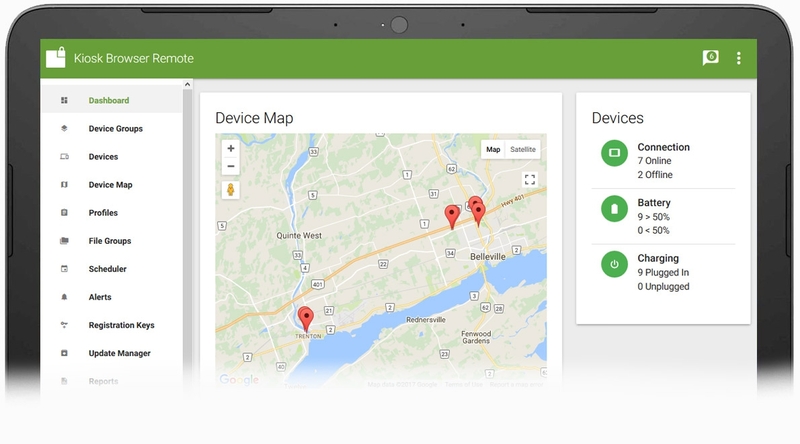 The app we chose–in addition to having all of the essential bells and whistles–enables us to monitor the tablets and remotely update the settings, which is a huge time-saver. Wireframes are a fantastic tool for development. They are quick to create and provide a visual representation of the potential interface without having to invest unnecessary time and money in programming or detailed design work. One of the main features of the kiosk is an interactive map, which automatically begins by centering on the location of the kiosk so that visitors can see what’s around them. Each business is represented by an icon, so that visitors can immediately tell whether it’s a restaurant, a winery or train station. Visitors can also show or hide entire categories of businesses, such as restaurants, attractions, accommodations, or transportation. 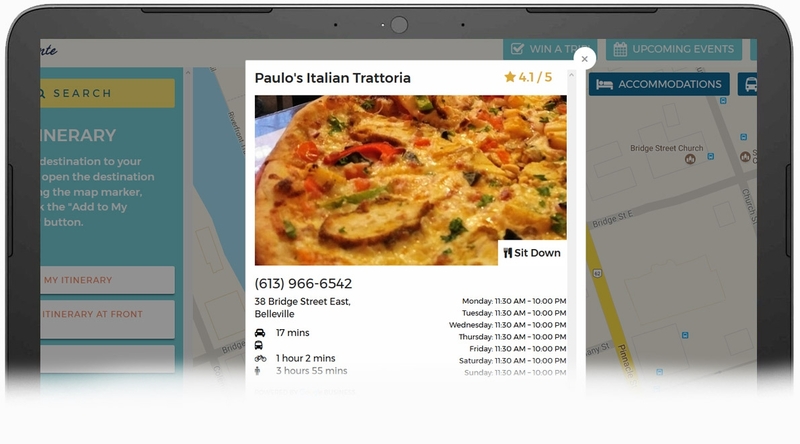 Visitors can tap on an icon to learn more about the business, including it’s Google and TripAdvisor ratings, contact information, operating hours, and distance from the visitor’s current location. 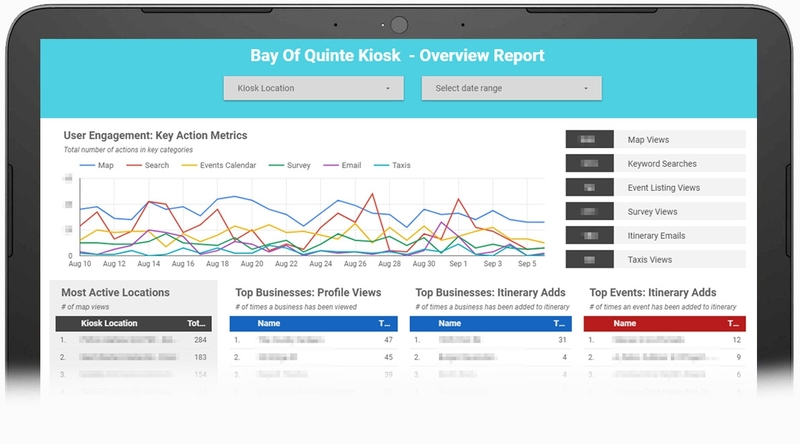 Even better, all of these details are automatically pulled from Google and TripAdvisor, so kiosk admins can save time on data entry. If the visitor is interested in exploring by topic, rather than browsing the map, they can use the built in search tool to find local businesses by keyword. 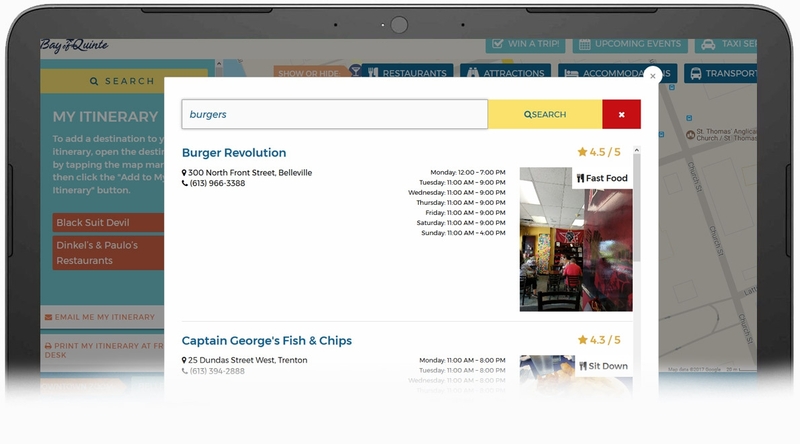 For example: simply type in “burgers” to find all the local burger joints! The kiosks also feature an up-to-date listing of regional events, so that visitors can see what’s happening. The event stream is easily browsable, automatically showing events that are happening in the near future. One of the nice features of the kiosk is that visitors can add locations and events to their own “Itinerary”. They can then email this itinerary to their phones or click a button to get the itinerary printed at the front desk. In either case, they can finish their kiosk experience with a portable list of their top interests, with all the details they need to start exploring. It’s always important to us to make it as easy as possible for our clients to make updates, and the kiosk was no exception. In this case, we built a customized administration area that doesn’t ask too much of its users. All of the event information is pulled directly from the public tourism website, so that nobody needs to re-enter event information for the kiosks. Additionally, all of the business information is populated from Google and TripAdvisor. This means that admins only need to enter the Google and TripAdvisor business ID’s and all of the rest of the information is filled out automatically. Reporting and analytics are critical tools. They enable you to learn what’s working well and what needs improvement. They also provide solid metrics that you can take back to your stakeholders to show a return on your investment. 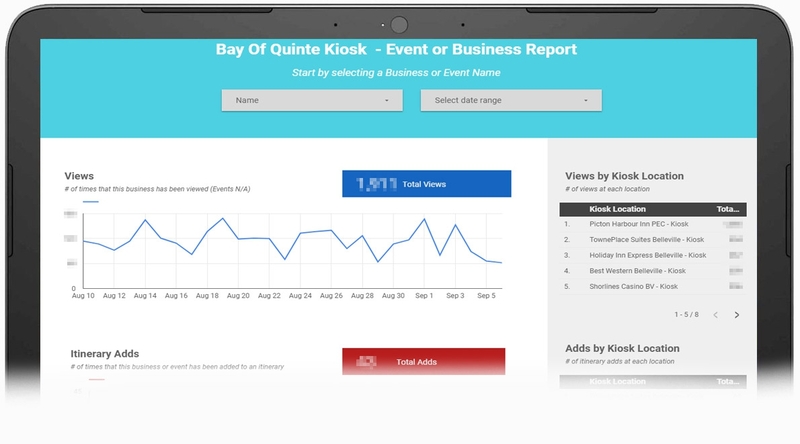 For the Bay of Quinte Kiosks we went beyond the standard Google Analytics suite and built a couple custom reports with Google Data Studio. This is a tool that enables highly customizable and interactive reporting. In this case, we built two custom reports. How many people are viewing the map? What are the top-viewed businesses and events? 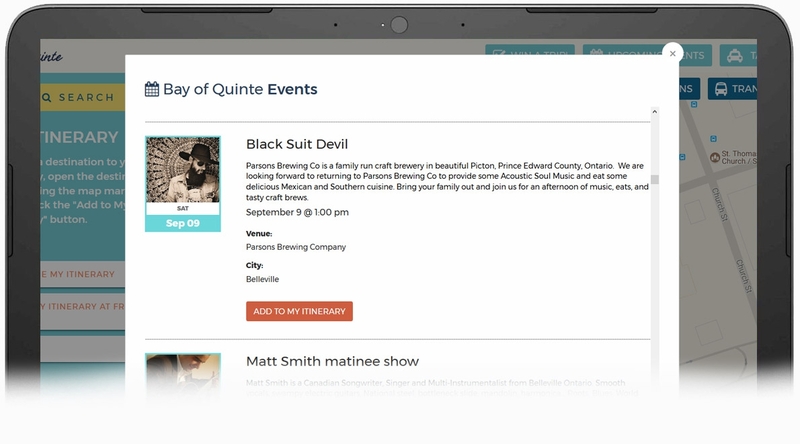 This enables the Bay of Quinte team to let their stakeholder associations see the value in the kiosks and potentially recruit additional partners. How many people are viewing my business? Which locations are they viewing my business from? How many people are adding my business to their itinerary? 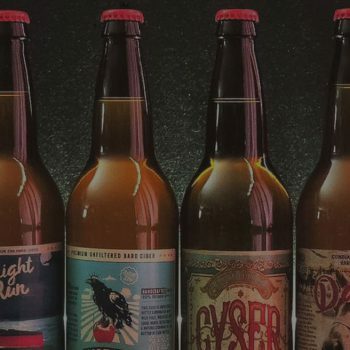 This report can be used to show individual businesses the value of participating in the program, and to recruit new businesses to sign up. One of the great things about our talented team of designers and developers is that they they have the skills and experience to build custom solutions that can be expanded in the future. Stay tuned for new kiosk updates, including expansion onto other platforms in the future!